Turn About Pegasus is a not-for-profit social enterprise launched in May 2008 by registered mental health specialist Tracie Faa-Thompson and equine expert Alison Porteous, and is run at Hetton Steads Farm, Northumberland. Sadly Alison died in 2015 but her legacy lives on. Pamela Ann Davison. Co-Director. Life long horsewoman with a 20+ year career working with vulnerable children and adults. Pamela is also an NVQ assessor. Jaki Duffy . Co-Director. Jaki has worked with children and families for over 20 years a passionate advocate for vulnerable multi- need families Jaki always sees the best in everyone. The two Andreas Mcgann & Jones. Sessional Equine Specialists. Always upbeat and willing. Alison Ainsley Life Long horsewoman and talented solicitor. Alison is a senior Litigator with the Association of Personal Injury Lawyers (APIL) and is a member of the Law Society Clinical negligence specialist panel. In her spare time Alison competes her Arabian in a range of equestrian sports exploding the myth that Arabians are not multi- talented. Alison is the voice of reason. Heather Vaulkhard Life Long Horsewoman, Successful business woman and committed to improving the well being and welfare of horses and humans. 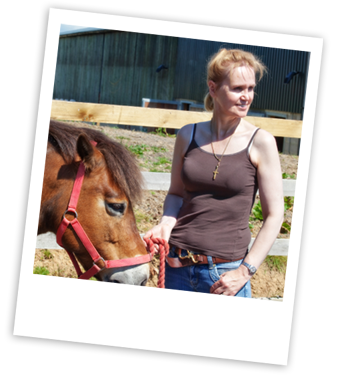 Heather's knowledge of both Holistic and Traditional medicines and therapies for horses is extensive. She is the one we all turn to for advice. Despite being extremely busy she always has time to give sound encouraging options for both human and horse physical and emotional health. Charlie (Lord Charles) 23 year old Arabian. Loving and gentle ex-endurance horse who was due to be put down as he became to old for endurance. He has been part of the team for 6 years. Buster 21 year old Arabian. Been with us since he was a 4 year old colt. Very fun loving and likes to party. Has a talent for flicking his tail in faces. Rambo & Madonna are a pair of 6 year old mini Shetland Geldings. On loan from Andrea Jones they have been with the team for 4 years and are constantly entertaining. Busy little people they like to trot and canter everywhere. Purdy 5 year old 15.2 cob. He has been with the team for 3 years. Despite his size he is a sensitive soul. Sabii, Nuno, Foxie & Lili. Canine team members. Newest Member. Dakota Prince (AKA Nosy Parker) 7 year old Pintabian. All members of the team horses. dogs and humans have been trained ONLY with positive reinforcement. We aim to do things with our co-opted team members (animals) not too them and give them choices whether to particpate or not and to add their own personal ideas to sessions. Despite many many years of experience the human team members do not adopt the 'expert' model. Humility and openess to new possibilities is our philosophy.